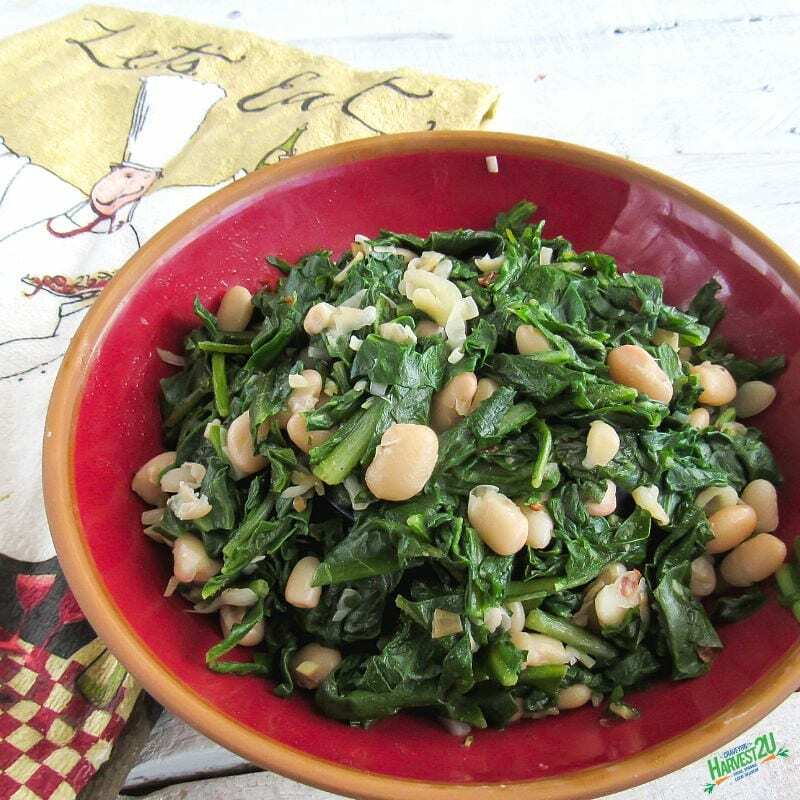 Chicory and Beans, Cicoria e Fagioli in Italian, is a simple greens and beans recipe that is delicious as a side dish yet hearty enough for a full meal. Jame Beard adds a pound of cooked Italian Sausage to his method, cooking it with the garlic and pepper. Others add a quart of chicken or vegetable broth instead of the cooking liquid to make it a soup. I used Catalogna Chicory for this. It is related to dandelion greens which you could use as a substitute for part or all of the chicory if you don’t have any. Like other dark green leafy vegetables, it is low in calories, with lots of fiber and vitamins A, C, and K as well as copper and manganese. Bring a quart of water to a boil in a large saucepan. Add chicory leaves and boil for 2-3 minutes. Reserve 1/2 cup of liquid and drain off the rest. In a skillet, heat a tablespoon of olive oil over medium heat. Add garlic and red pepper flakes. Cook for a few minutes until it is fragrant, and the garlic has softened. Add the cooked chicory leaves, cannellini beans and 1/2 cup of reserved cooking liquid. Simmer until the chicory is very soft and the liquid has been mostly absorbed about 5 minutes.